Is the lowly Dependent’s Pension Fund being overlooked? There has been much chatter surrounding the establishment of a Sovereign Wealth Fund (SWF) in Guyana. Work has begun towards achieving that goal and at some point in time Guyanese would want to have their say about the matter. 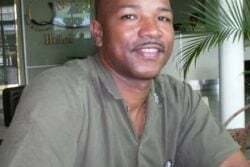 This writer understands that when the time comes Guyanese will be given an opportunity to comment on the legislation being proposed for the creation of the SWF. Towards this end, all Guyanese must know and have a clear understanding of the concept and dynamics of the SWF. Indeed, SWFs are growing in popularity with increasing numbers of countries looking at ways to establish such a facility. Just over one week ago the largest SWF, that of the Government of Norway, topped US$1 trillion in value in less than 30 years. Others are within striking distance of the coveted US$1 trillion mark which bring many a feeling of comfort. If likened to a marathon, Norway would have won the race comfortably. There is great anticipation that SWFs soon will be commonplace, especially among developing countries. SWFs make up about six per cent of the share of the global assets that belong to institutional investors. In light of its growing popularity and emerging prominence in Guyana, this week’s article seeks to shed light on the concept, purpose and role of the SWF. A sovereign wealth fund is a state-owned investment fund or entity. It has become a very popular medium for investment and is the new buzz word in Guyana. Within the last five to six years, several countries in Africa have set up SWFs with the result that about 20 per cent of the countries have or are considering having the investment medium. Counted among the African countries with recent or longstanding SWFs are Algeria, Angola, Botswana, Equatorial Guinea, Gabon, Ghana, Libya, Mauritania and Nigeria. It is expected that Mozambique and Tanzania will soon have SWFs while Sierra Leone is contemplating how to do it. Within the Caribbean, the most prominent SWF is the one set up by Trinidad and Tobago. The key characteristic of the SWF is government control of the funds that are used in the investment. As such it is an investment that is owned and controlled by government. All the SWFs have that common characteristic. Additionally, the SWF falls under the control of the Central Bank or the Ministry of Finance of a country. Another common characteristic of the SWF is its time horizon. It represents long-term investments which often do not have a fixed time horizon beyond that of the purpose of planning the investments. A SWF is thus a pool of money that is invested in various financial assets. These assets include things like stocks, bonds, precious metals and other investment instruments. The success of a SWF therefore depends heavily on how well managed the funds are. The Norwegian SWF is really the pension fund of the Government of Norway that has been invested to reach the enormous size to which it has grown. Based on the definition of a SWF and the experience of Norway, a quasi SWF exists in Guyana already and for much longer than many other such funds around the world than people seem to realize. It is called the Dependants’ Pension Fund (DPF) which is based on the Dependants’ Pension Act of 1923 with various amendments over time. It is surprising that those who are responsible for managing that fund have not stepped forward to let Guyanese know that a basis exists for establishing a wealth fund. In Guyana’s case, the Ministry of Finance controls the Dependants’ Pension Fund and the Accountant-General is the Chairman of the Board of Directors. There are lessons that can be learnt from the way in which the Pension Fund has been managed over the years. This experience undoubtedly contains valuable lessons for the more robust and sophisticated SWF that is being contemplated at the moment. In light of this, Guyana might want to rethink its attitude towards the DPF and the role that it can play in advancing the interest in the new SWF that the government has in mind. The typical practice of the more prominent and successful SWFs is to link the money used in the investment to receipts from some natural resource. In the case of the very large funds such as those of Norway, Saudi Arabia, the United Arab Emirates (UAE) and Kuwait, they are linked to oil revenues. Other natural resources like diamond and high-income generating precious metals often make it possible for countries to find resources to put into the SWF. As a consequence, SWFs have come to be associated with countries that have budgetary surplus emanating from high revenues garnered from exports and very little or no international debt. From what is known, Guyana has not linked its existing wealth fund (DPF) to any specific source of income. The money for investments come from the contributions of its members and transfers from the Consolidated Funds, including whenever there is a shortfall in expected interest income. Any discussion about an SWF in Guyana should start with how to treat the DPF. The search for lessons about SWFs can include consideration of the reasons the DPF in Guyana is not as large as that of Norway or any of the smaller successful funds. SWFs are popular in countries dependent on the export proceeds from natural resources such as oil and minerals as it is a mechanism to guard and cushion them against the adverse effects of the volatility of those prices. Recently, cases of both volatility and exhaustion were evident in global commodity markets. Oil prices dropped significantly resulting in declining oil revenues in oil-producing economies. But that is not necessarily the only basis upon which to build a SWF. From the table below showing the top 10 SWFs, it is clear that not all successful funds are based on set-asides from oil or some other natural resource. An equal number of the top-ranked funds rely on non-commodity excess revenues. The key to a successful SWF then has to be the management of the investment and the purpose that it intends to serve. The purpose must be aligned with the investment strategy for the latter to work effectively. Other reasons for establishing a SWF are linked to the protection and stabilization of the budget and economy, including, diversifying economies from non-renewable commodity exports; assisting central banks use up unwanted liquidity; increasing savings for future generations or uncertain times; funding social and economic development; ensuring sustained long-term capital growth and earning greater returns than on foreign exchange reserves. According to Minister Trotman, Guyana’s SWF Bill was drafted by the Commonwealth Secretariat with input from the Government of Guyana and follows the Santiago Principles, a set of generally accepted principles and practices that reflect SWFs’ investment practices and objectives. The Bill is patterned after that of Norway, which therefore suggests that Guyana’s SWF would be a savings fund. According to Minister Trotman, before oil revenues come on board in 2020, Guyana’s SWF will seek to set aside revenues from the other industries in the extractive sector like gold, timber, bauxite and other rare minerals that are mined, so that by 2020 experience and discipline with respect to the management of the fund will be gained. The question becomes what will the government do to gain the experience that it is looking to acquire? It appears to this writer that the existing SWF known as the DPF would be a good place to start. That fund is clearly in need of strengthening and that action could be taken now and the experience used to inform the next SWF. 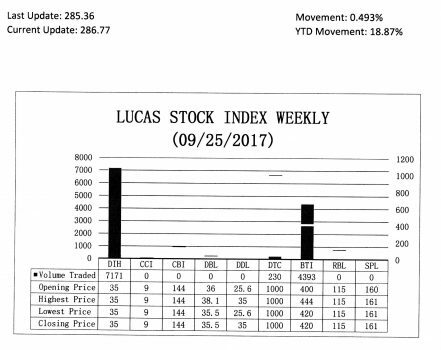 LUCAS STOCK INDEX The Lucas Stock Index (LSI) rose by 0.493 per cent during the fourth period of trading in September 2017. 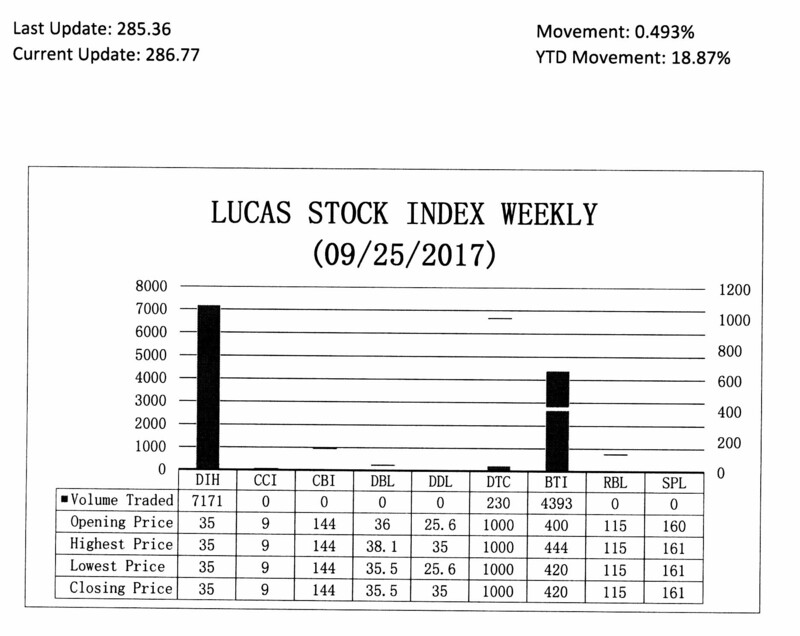 The stocks of three companies were traded with 11,794 shares changing hands. There was one Climber and there were no Tumblers. The stocks of Guyana Bank for Trade and Industry Limited (BTI) increased five per cent on the sale of 4393 shares. In the meanwhile, the stocks of Banks DIH (DIH) and the Demerara Tobacco Company (DTC) remained unchanged on the sale of 7,171 and 230 shares respectively. Guyana’s Sovereign Wealth Fund (SWF): Is there a lesson above all lessons to be learnt?